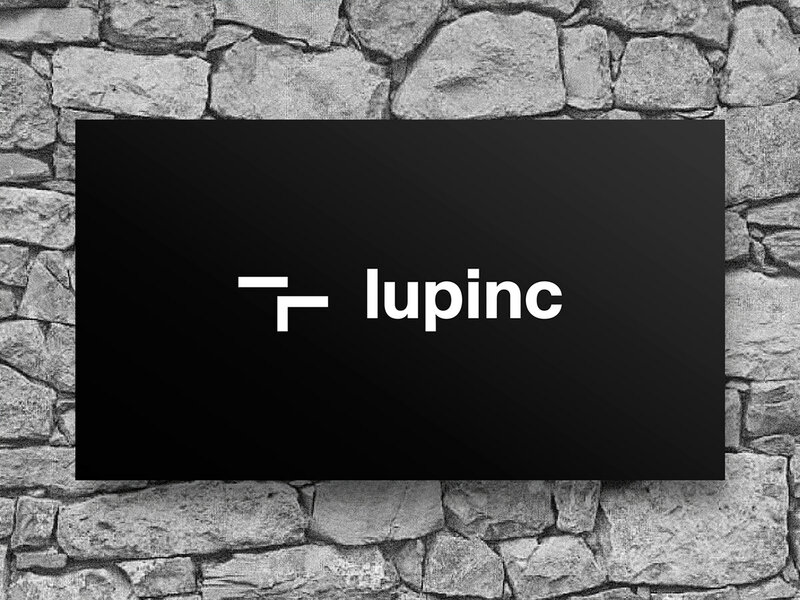 The identity of the Lupinc Wine Estates is based on a radical approach to graphic design. 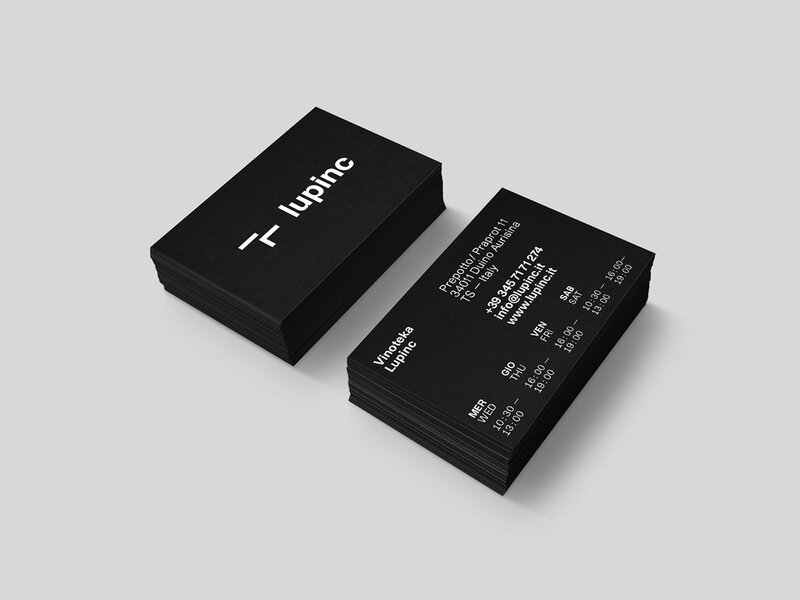 It aims to communicate quality and elegance by using simple and basic forms. The harmonic visual image system, inspired by Gestalt theory, consists of simply-shaped compositions. 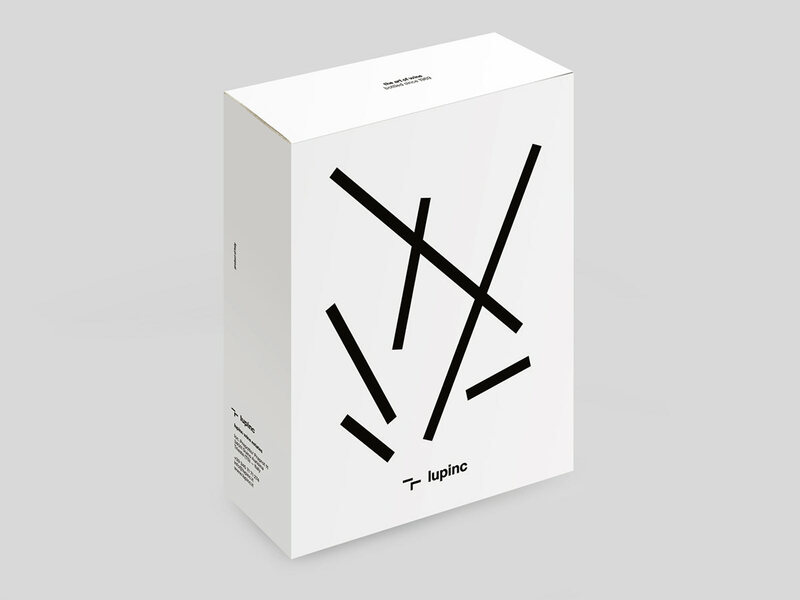 The identity is communicated through an experimental use of typographic elements on wine labels, through a geometric motif on the transport box, and through a lively decoration on the gift box. 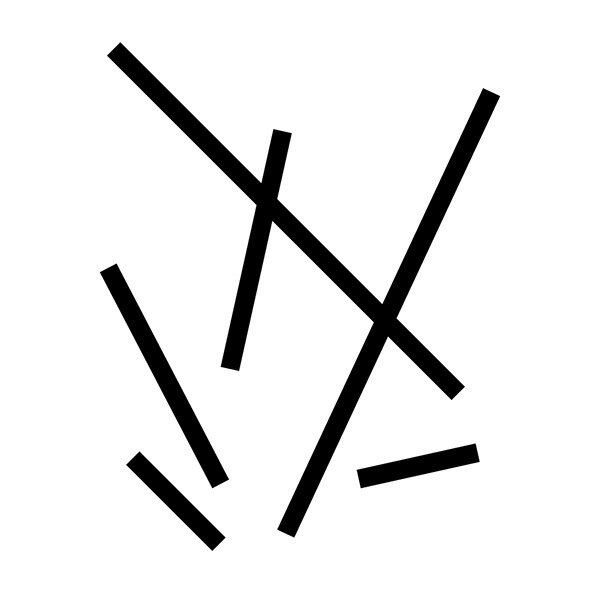 Here the graphical ‘interpretation of winery’ is based on distinctive minimalistic symbols combined with a vinicultural spirit. 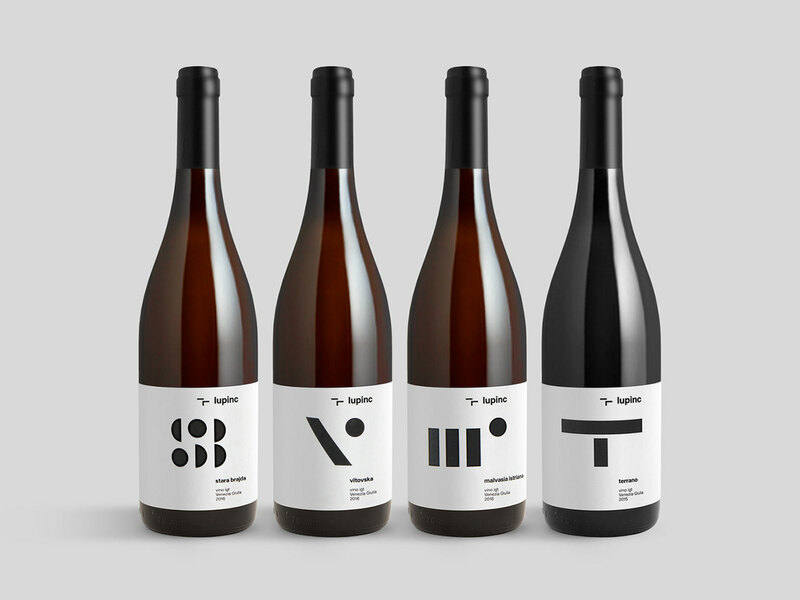 "A clean and well structured identity system executed and appropriated across many different items from the wine labels on the bottles to the supporting printed material and packaging. 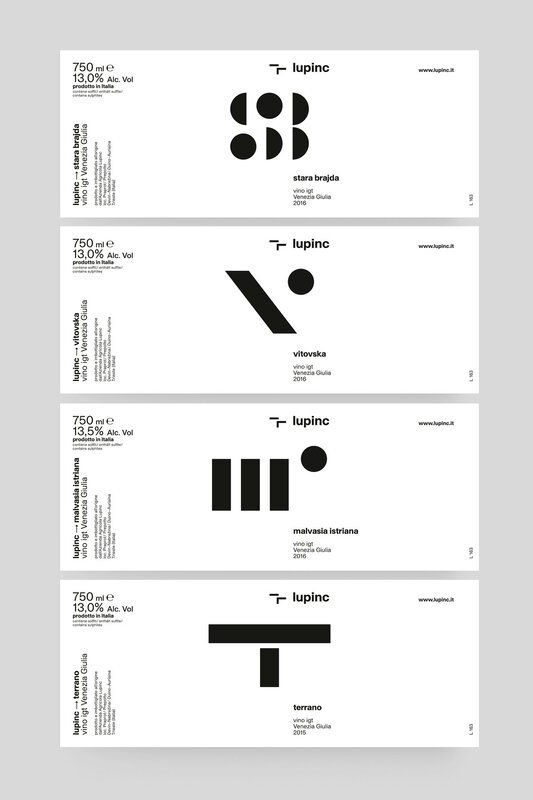 The balance between black and white, abstract form and type is superb, modern and fresh. The solution suggests an open design system with many exciting products to be published in the future." Wine labels: size 200×80 mm, silkscreen print, black color on Martelé Blank Plus white paper. 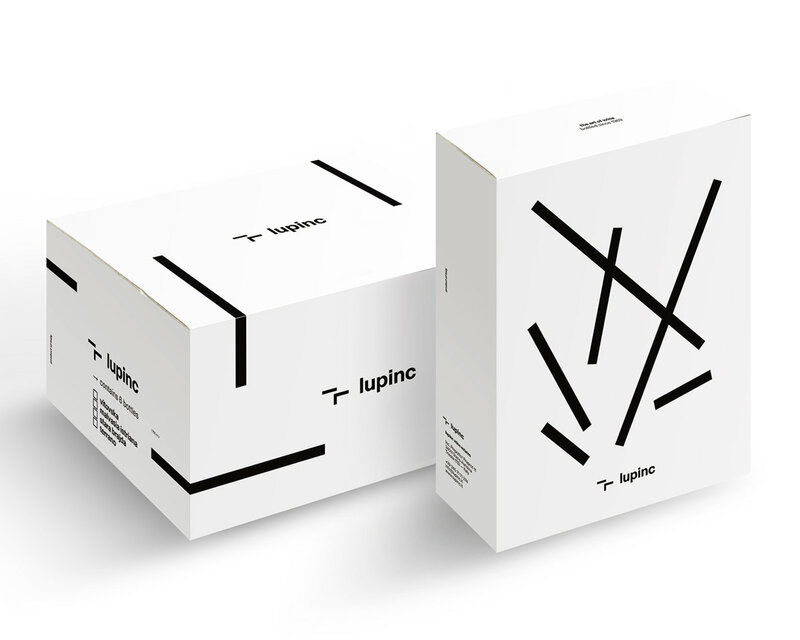 Transport box for 6 bottles: size 315x240x175 mm (closed packaging), one-color print (Pantone Process Black) on white cardboard. 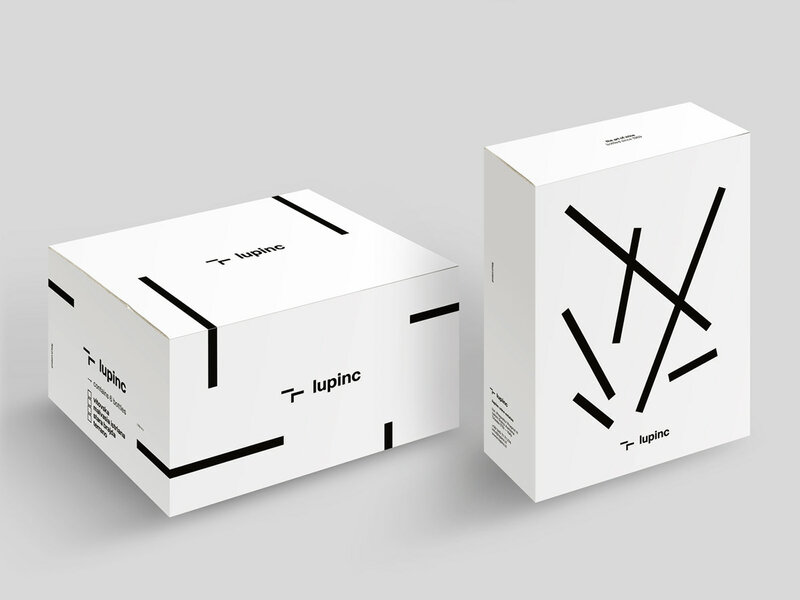 Gift box for 3 bottles: 250x85x320 mm (closed packaging), one-color print (Pantone Process Black) on white cardboard. 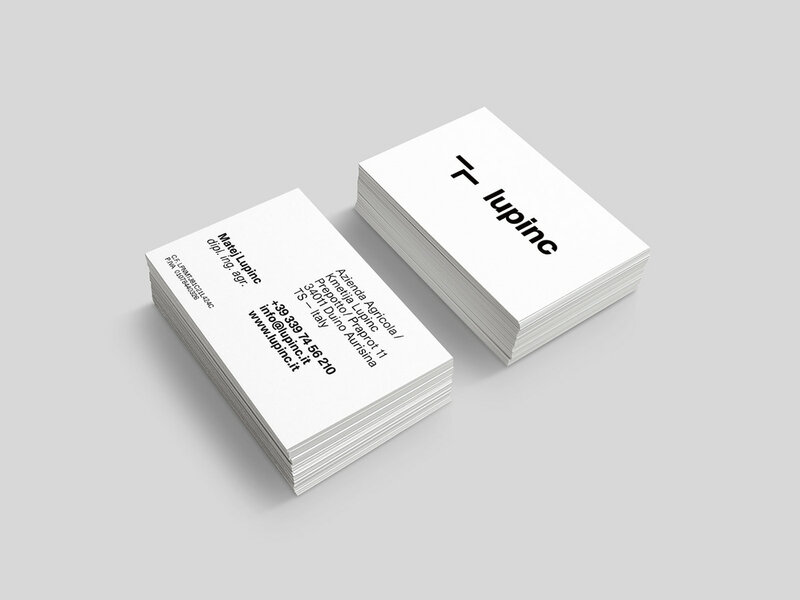 Business cards: size 85×55 mm, offset print on white 350 gsm paper. 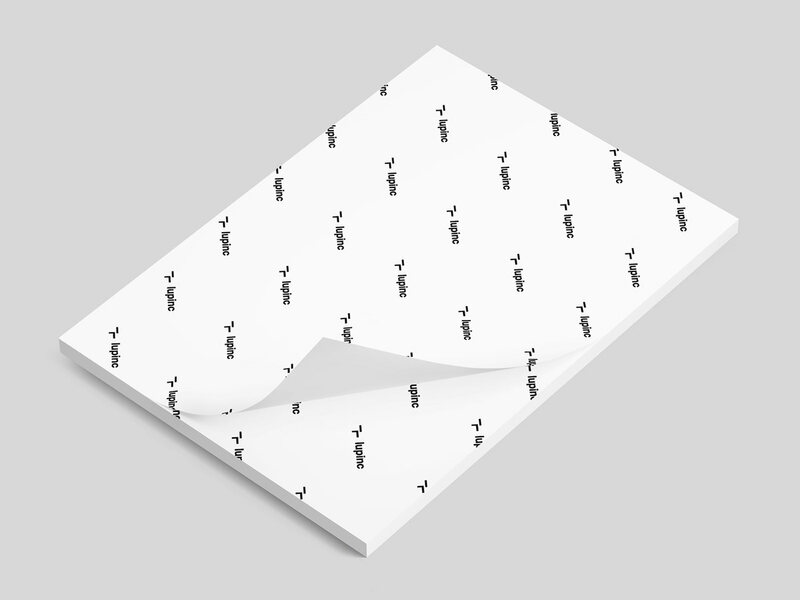 Wrapping paper for wine bottles: 490×370 mm, one-color print (Pantone Process Black) on white paper. 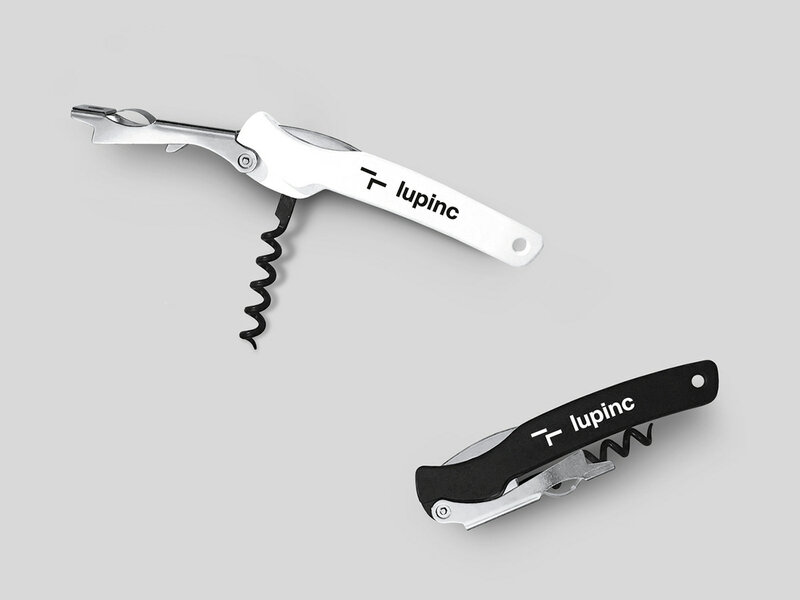 Corkscrew: one-color print on plastic. 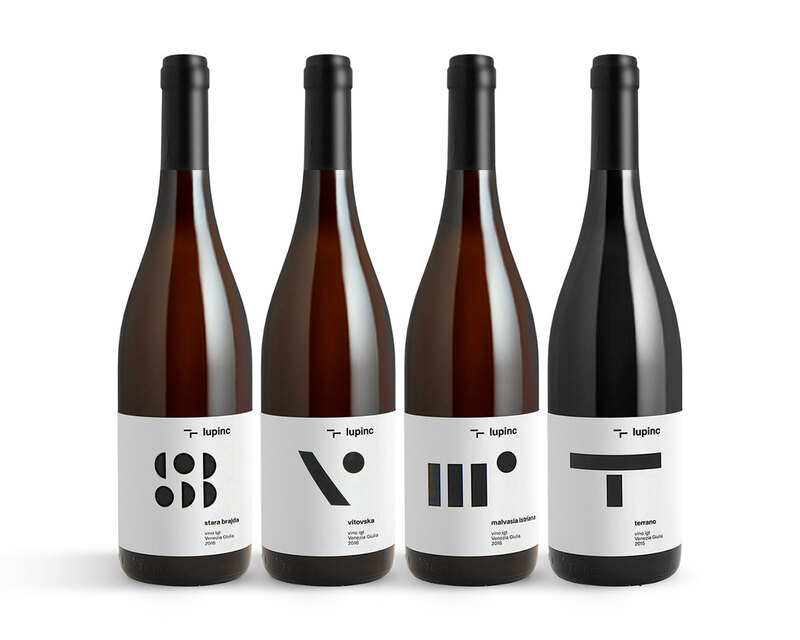 Bottles typology: Borgognotta Alta 0,75 l.
The project won the Brumen Award 2017 (Ljubljana, Slovenia), won a Jury Distinction at the Joseph Binder Award 2018 (Vienna, Austria), was nominated and got the official mention of Finalist at the European Design Awards 2018 (Oslo, Norway) and was virtually nominated (nomination declined by myself because of the 'pay a high fee to get awarded' scheme) for the German Design Award 2019 (Frankfurt am Main, Germany). 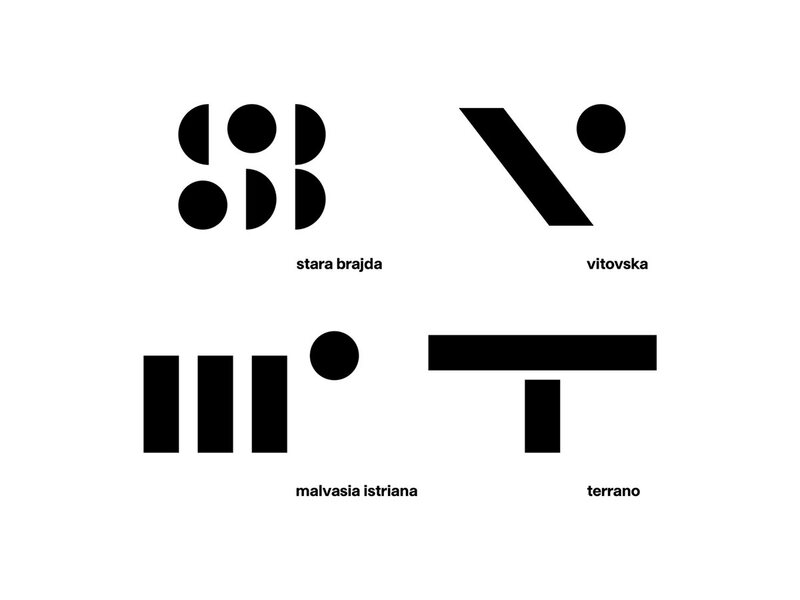 It was exhibited at the 8th Brumen Biennial of Slovenian Graphic Design at Narodna Galerija in Ljubljana (Slovenia) and at A Feast of Colour & Form — Designforum / Museumsquartier in Vienna (Austria). Physical copies of the project are part of the MAO collection (The Museum of Architecture and Design of Slovenia). 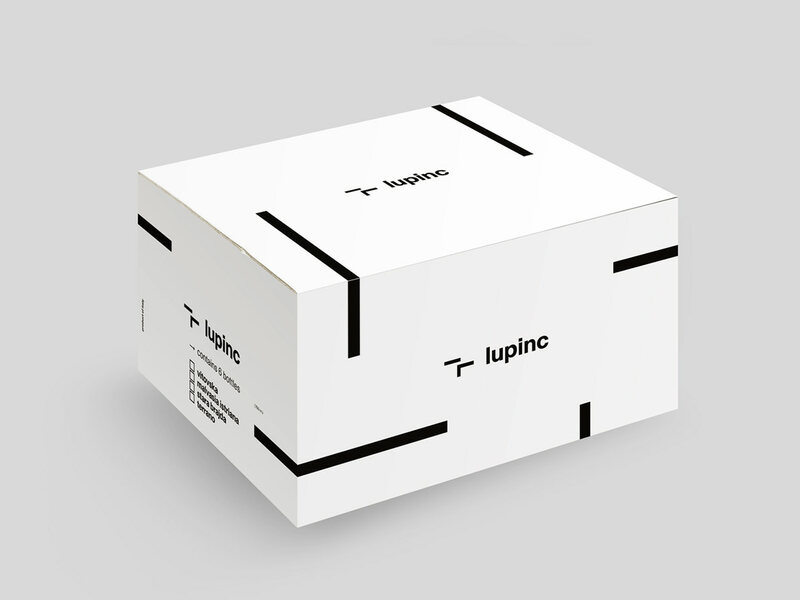 Visual identity, wine labels, packaging and applications for the Lupinc Wine Estates.